Approx. 36"/91cm around x 20"/51cm deep. Choose worsted or chunky weight! 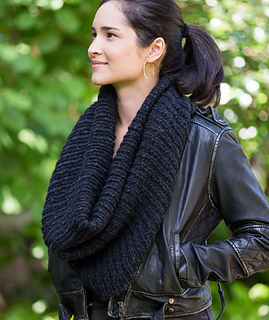 The first half of this ribbed cowl is knitted flat to split over one shoulder or create an opening in the front or back. 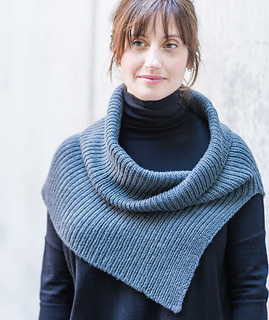 Then, it’s joined in the round for a softly draping cowl or collar. 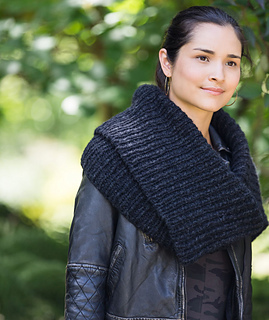 Tubular cast-on and bind-off lend a sophisticated, ready-to-wear finish. Frontwards, backwards, upside down—wear it any way you like! Approx. 36”/91cm around x 20”/51cm deep. Worsted-weight version: Approx. 550 yds/503m worsted-weight yarn. Shown in grey in 5 skeins Shibui Drift (110 yds/101m each), Color 11, Tar. Chunky-weight version: Approx. 385 yds/352m chunky-weight yarn. Shown in black in 4 skeins Rowan Brushed Fleece (115 yds/105m each), Color 262. Worsted-weight: US 8 (5mm) 24”/60cm circular needle, or size to obtain gauge. Chunky-weight: US 10 (6mm) 24”/60cm circular needle, or size to obtain gauge. Both gauges:US F/5 (3.75mm) crochet hook for provisional cast-on. Five yds/m smooth DK- or worsted-weight waste yarn for provisional cast-on. Spare circular needle, gauge size or 1 size smaller, for tubular bind-off. Worsted-weight: Approx. 19 sts/30 rows = 4”/10cm in rib pattern, after blocking. Chunky-weight: Approx. 12 sts/20 rows = 4”/10cm in rib pattern, after blocking.